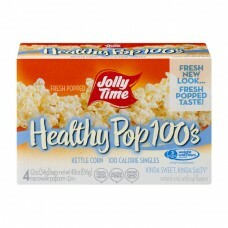 Jolly Time Healthy Pop 100's Microwave Popcorn Kettle Corn. Fresh popped. Fresh new look. Fresh popped taste! 100 calorie singles. 3 SmartPoints value. Weight watchers endorsed. Per bag 5 cups popped popcorn. 100% whole grain. Gluten free. Non GMO kernels. Kinda sweet...Kinda Salty®. Natural and artificial flavors. 4-1.2 oz. (34g) bags. Net wt. 4.8 oz. (136g). Popcorn you can trust. Our kernels are grown on the best Midwest family farms by folks we have known for generations, literally... meet the Hogue family of Odebolt, Iowa. Jack Hogue's father, jack Sr. began growing for us in 1942. today, Jack counts on son, Tyler, and grandson, Lincoln, to help him plant & harvest Jolly Time® pop corn! Printed in U.S.A. See popping bag for popping directions. Weight Watchers SmartPoints® plan is proven to reduce your weight. It goes beyond calories to help you make smarter choices. Learn more at weightwatchers.com. Write to PO Box 178, Sioux City, Iowa 51102 to tell us what you think about Jolly Time. We're listening. Share the family fun! Good Housekeeping. Quality tested. Since 1909. Limited warranty. ghseal.com for details. Weight watchers for services and SmartPoints are the registered trademarks of Weight Watchers International, Inc. trademarks are used with permission by American Pop Corn Company. We listen to our customers, and we'd love to hear from you. Call 712-239-1232 M-F 8am to 5pm CST or pop in at jollytime.com. Read about our proud growers at: jollytime.com/family/growers. ©APCC 2017.